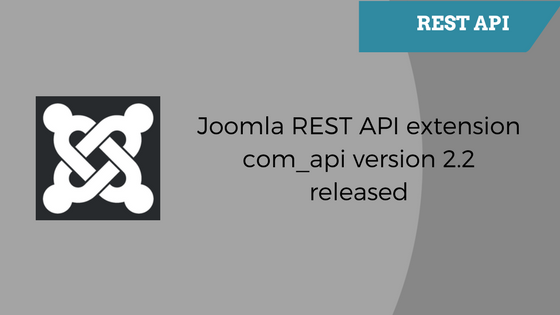 In the past few weeks we have made incremental upgrades to com_api, our REST API extension for Joomla. For those who are not aware, com_api is a quick and easy way to add REST APIs to Joomla. Extensible via plugins, you can easily add support for more Joomla extensions. This blog details the changes & improvements done from from 2.0 to 2.2. The key change is support for SEF URLs, which will enable you to create better URLs for your API endpoints, like /api/articles/article/34. Till now, the API endpoints could only be accessed by Joomla non-sef URLs, making the URLs look clunky. Few other changes include support for the Authorization header, and being able to override the response envelope for the resources. Also a few bug fixes around viewing logs and a performance improvement for sites that had a lot of API consumers. Version 2.0 and onward introduces a backward compatibility break in the default output structure of the response. AppCarvers customers please check the blog on appcarvers.com before you upgrade. To know about the full changelog, read on. iSpring SCORM officially supported in Shika !